Introduction: To report the results of a large series of patients undergoing treatment for Duane’s syndrome. Methods: Patients with Duane’s syndrome undergoing strabismus surgery of a horizontal muscle recession procedure, medial rectus recession for an esodeviation or lateral rectus recession for an exodeviation, in order to correct an abnormal head position (AHP) and a significant tropia in primary position were identified. Amount of recession varied with the angle of deviation in forced primary position, versions and ductions, and intraoperative forced ductions. Elimination of AHP was used as a criterion for success. Results: Fifty nine patients were treated with either unilateral or bilateral medial or lateral rectus recession. Mean follow up was 3.1 years. Ninety three percent achieved a postoperative alignment of ⩽15° AHP, 66% achieved ⩽5° AHP. Only three patients, two from the unilateral Type II group and one from the bilateral combined Types I and II group, went on to have a second procedure for a noticeable residual AHP. Conclusions: Success (good to excellent results) of horizontal muscle recession was achieved in 93% of patients. Unilateral or bilateral horizontal rectus muscle recession offers a simple and effective surgical option for eliminating AHP and is our treatment of choice in patients with Duane’s syndrome. The incidence of Duane’s syndrome is 1% to 4% of strabismus patients.1 It is the most common type of congenital ocular aberrant innervation.2 Alexander Duane, as well as other authors, characterised this entity with the following features: (1) complete or partial absence of abduction of the affected eye; (2) partial, or rarely complete, deficiency of adduction of the affected eye; (3) retraction of the affected eye into the orbit on adduction; (4) a sharply oblique movement of the affected eye either up and in or down and in on adduction; (5) partial closure of the eyelids (pseudo-ptosis) of the affected eye on adduction, and (6) deficiency of convergence in which the affected eye remains fixed in primary position while the unaffected eye is converging. The major indications for surgical correction in patients with Duane’s syndrome are an abnormal head position (AHP) of greater than 15° and/or a significant deviation in primary position. Several surgical options have been described in the literature. These include ipsilateral rectus muscle recession,3,4 vertical rectus muscle transposition,5 lateral posterior fixation sutures,6 simultaneous medial and lateral rectus recessions,7,8 and surgery on the normal eye.9 We have chosen ipsilateral medial or lateral rectus muscle recession as the surgical procedure. The purpose of this study is to report the results of a large series of patients undergoing a unilateral or bilateral horizontal muscle recession procedure for Duane’s syndrome. All charts of patients seen with the diagnosis of Duane’s syndrome at the University of Iowa Hospitals and Clinics between 1972 and 1999 were reviewed. Exclusion criteria were previous strabismus surgery done elsewhere, primary surgery other than recession of one or two horizontal muscles, and postoperative follow up less than four weeks. The indication for surgery was an AHP of greater than 15°. All patients had surgery for this AHP. The visual acuity of each patient was assessed by Snellen letters, line pictures, HOTV letters, or by fixation pattern. Abnormal head position was measured pre- and postoperatively in early cases by estimation and later by using an orthopedic goniometer when the age of the patient permitted. Strabismus measurements were done by alternate cover prism test in forced primary position and in the AHP at distance and near. Versions and ductions were documented on a scale of +4 (marked overaction) to 0 (normal) to –4 (marked underaction, cannot get past midline). Forced duction testing was performed intraoperatively. The severity of the restriction was measured either by a scale of +1 to +4 restriction (the higher number indicating increased tightness) or by a scale of mild, moderate, or severe restriction. Surgical technique was recession through a limbal approach, using an adjustable suture when feasible. Evaluations were performed preoperatively, postoperatively at one week, six weeks, and periodically thereafter. The effectiveness of surgery on the AHP was determined at the last postoperative visit. The amount of final postoperative AHP was categorised into four groups:>15° (poor), ⩽15° (good), ⩽10° (very good), and ⩽5° to no AHP (excellent). Patients were categorised into groups by unilaterality versus bilaterality and by type of Duane’s syndrome. Patients classified as Type I had an esotropia in forced primary position with limited abduction and little or no adduction deficit. Duane’s Type II patients had an exotropia in primary position with limited adduction. Duane’s Type III patients were limited in both abduction and adduction. These patients had either an esotropia or an exotropia in primary position depending on the imbalance of the abnormal innervation. Charts of 199 patients found with the diagnosis of Duane’s syndrome were reviewed. One hundred and forty patients were excluded from the study group for one of the following reasons: did not require or did not choose to pursue surgical correction (n = 108), had undergone strabismus surgery elsewhere (n = 19), operated for a moderate angle of deviation without an AHP (n = 5), had undergone vertical muscle surgery in addition to horizontal muscle surgery (n = 3), or had less than one month postoperative follow up (n = 5). A total of 59 patients were included in the study group. All had surgical correction by recession of one or two horizontal muscles. The procedure performed was determined by the amount of deviation in primary position and the degree of abnormal head position. In some bilateral cases unilateral surgery was performed because of asymmetrical involvement. The mean age was 13 years (range, 9 months to 54 years). The ratio of males to females was 30:29. 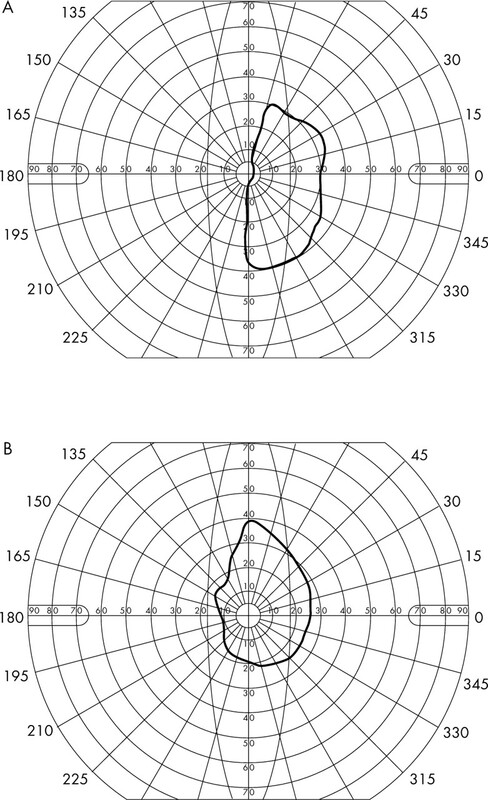 All patients had a visual acuity of at least 20/40 or central, steady, and maintained by fixation pattern in each eye except for one 33 year old female who had anisometropic amblyopia of the left eye (20/70). The average follow up was 3.1 years (range, 1 month to 18 years). Fifty eight percent of the surgical group had unilateral Duane’s syndrome, while 42% were affected bilaterally. Of the unilateral group, the affected eye was manifested in five right eyes and 29 left eyes. The number of patients with each type of Duane’s syndrome is listed in table 1. AHP prior to surgery ranged from a 15° to a 45° head turn (mean 25°). Forty eight patients (81%) who were esotropic in primary position had medial rectus muscle recession. Eleven patients (19%) who were exotropic in primary position had lateral rectus recession. In fourteen patients the recessed muscle(s) was placed on an adjustable suture. Either unilateral or bilateral surgery was performed depending on the amount of deviation in forced primary position and on evidence of a unilateral or a bilateral disorder. Intraoperative forced ductions were reported on 39 patients. Incomplete records may account for those not recorded. All were positive, ranging from +1 to +4 restriction. Of these patients, 82% had at least a moderate (⩾+2) restriction. No correlation was found between amount of restriction and degree of preoperative AHP. A summary of the raw pre- and postoperative data, including the deviation in primary position and the amount of head turn, is shown in table 2. Eleven patients had fields of single binocular vision recorded although both pre- and postoperative fields were available in only one patient. This patient had bilateral Duane’s Type I. The fields are shown in figure 1. The change in the postoperative field to encompass primary position is apparent. Single binocular visual fields (patient 35). (A) Preoperative. (B) Postoperative. The pre- and postoperative versions of each patient are shown in table 3. Fifty of the patients had preoperative deficits in the affected gaze of –3 or worse. This deficit improved in 31 of the cases but was never eliminated. In 21 patients, a limitation of the previously unaffected gaze occurred postoperatively. There was no correlation between the limitation of versions and the AHP in both pre- and postoperative measurements. The postoperative AHP results for each type of Duane’s syndrome are listed in table 4. Four patients had a 15° AHP preoperatively. Postoperatively, one had no AHP, one had 5° AHP, one had 10° AHP, and one was unchanged. The latter patient had bilateral Type III Duane’s and had no significant change in AHP or versions but did have a marked reduction of the deviation in primary position (40 to 10 prism diopters esotropia). Thus, all patients with a preoperative AHP of 15° had either an improvement of their head turn or their eye alignment. Four patients had a postoperative AHP >15°. Three required a second procedure. Two had unilateral Type II and one had bilateral Type I and II. All were initially well corrected but the AHP returned at six weeks, four years, and three years respectively. The fourth patient, with unilateral Type I Duane’s syndrome, did not pursue a second surgery. Primary position alignment was reduced from 35 to 20 prism diopters esotropia and the AHP was also reduced from a 30° to a 20° left head turn. The goal of surgical correction of patients with Duane’s syndrome is to relieve the AHP and correct the deviation in primary position without causing an increase in up- or downshoots, globe retraction, or narrowing of the palpebral fissure. In planning surgery on these patients, it is important to approach each case individually and to take into consideration all factors, including primary position alignment and any AHP. Foster6 warned that ipsilateral medial rectus recession should be avoided in the primary transposition procedure and even as a secondary procedure because of the risk of decreased adduction and the possibility of late overcorrection. He proposed vertical muscle transposition augmented with lateral posterior fixation sutures to enhance the tonic abducting force without compromising adduction. Small, induced vertical deviations were found in primary position in 20% of patients. Botulinum toxin injection14,15 of the ipsilateral medial rectus muscle or a contralateral medial rectus muscle recession done secondarily was suggested for notable residual deviation even after this augmented transposition procedure. Resections of horizontal muscles of the involved eye should be avoided because the effect of this procedure is unpredictable. In light of the underlying innervational abnormality, the co-contraction becomes more evident16–18 and large iatrogenic deviations can be produced. In Duane’s Type I (no adduction deficit), the amount to recess the medial rectus muscle is the amount necessary to free the forced ductions.10 In our study, all intraoperative forced ductions done were positive and became free after disinserting the appropriate rectus muscle from the globe. Most patients had preoperative version deficits in the affected gaze of –3 or worse. This deficit improved in most cases but was never eliminated. Motility was not normalised and, in fact, although the affected gaze may have improved, there was a resultant limitation of the opposite gaze. This may be the result of large recessions. Although versions were not full postoperatively, strabismus, and thus the AHP, improved and did not recur. It is our conclusion that the abnormal head position is not the result of the deficit versions, but of the need to obtain binocularity. Although in retrospect this may have been tested by observation of the AHP after monocular occlusion, this was not done. Surgery decreased or corrected the deviation in primary position and thus alleviated the abnormal head position. In bilateral cases, it has been recommended to perform simultaneous medial and lateral rectus recessions. However, Goldstein and Sacks7 add that although they suggest that this may be the procedure of choice, the incidence of bilateral Duane’s syndrome is small and the number needing surgical correction is even smaller. More time and cases are necessary to substantiate this approach. Of the seventeen cases of bilateral Type I, 12 had unilateral medial rectus recession surgery. All were corrected to the very good to excellent groups. There were five cases of bilateral Type III and two cases of bilateral combined Types II and III. These were also well corrected. Only the bilateral combined Types I and II required re-operation. The difficulty with the surgical treatment of Duane’s Type II patients with exotropia has been noted by other authors.9 The current study confirms this finding. All patients requiring a second procedure for a residual AHP were either from the unilateral Type II group or from the bilateral combined Types I and II group. These three patients were undercorrected following the initial surgery. The remaining three Type II patients had only one surgery and results were good with a ⩽10° head turn on the final visit. In Type III patients, the co-contraction and the greater frequency of up- and downshoots21 may account for the problem in predicting the necessary amount of recession. As with any retrospective study, however, there are limitations. All patients had at least one month postoperative follow up. At this point, the result was successful, but obviously that could change with further follow up. As postoperative change may occur at any time, the minimum amount of postoperative follow up has never been determined. Because of the length of time of the period reviewed and the large number of study patients, there were numerous preoperative examiners. In early cases, the head position was estimated although in many later cases it was measured. It was, however, the surgeon who ultimately judged the head position. Ideally, the head position would be measured objectively in all cases but owing to the young age of some patients, this is not always possible. It has been noted at our institution that, in most cases, the estimated amount of AHP corroborated closely to that measured. With a mean follow up of 3.1 years, this series demonstrates the stability of successful results in medial or lateral rectus recessions. Only three went on to have a second procedure, confirming the difficulty in treating Type II Duane’s syndrome patients. Excellent outcomes of an AHP were achieved in patients who had recession of the appropriate horizontal muscles. This method offers a simple and effective surgical option for eliminating an abnormal head position and is our treatment of choice for patients with Duane’s syndrome. DeRespinis PA, Caputo AR, Wagner RS, et al. Duane’s retraction syndrome. Surv Ophthalmol 1993;38:257–88. Freedman HL, Kushner BJ. Congenital ocular aberrant innervation-new concepts. J Pediatr Ophthalmol Strabismus 1997;34:10–16. Duane A. Congenital deficiency of abduction, associated with impairment of adduction, retraction movements, contraction of the palpebral fissure and oblique movements of the eye. Arch Ophthalmol 1905;34:133–59. Kraft SP, O’Donogue EP, Roarty JD. Improvement of compensatory head postures after strabismus surgery. Ophthalmol 1992;99:1301–8. Molarte AB, Rosenbaum AL. Vertical rectus muscle transposition surgery for Duane’s syndrome. J Pediatr Ophthalmol Strabismus 1990;27:171–7. Foster RS. Vertical muscle transposition augmented with lateral fixation. J AAPOS 1997;1:20–30. Goldstein JH, Sacks DB. Bilateral Duane’s syndrome. J Pediatr Ophthalmol 1977;14:12–7. Souza-Dias C. Additional consequences of muscle co-contraction in Duane’s syndrome. In: Smith-Kettlewell Symposium on Basic Sciences and Strabismus. Annex to Congreso del Consejo Latinoamericano de Estrabismo (CLADE). Sao Paolo: Oficinas das Edicoes Loyoila, 1976:93. Saunders RA, Wilson ME, Bluestein EC, et al. Surgery on the normal eye in Duane retraction syndrome. J Pediatr Ophthalmol Strabismus 1994;31:162–9. Pressman SH, Scott WE. Surgical treatment of Duane’s syndrome. Ophthalmology 1986;93:29–38. Scott WE, Werner DB, Lennarson L. Evaluation of Jensen procedures by saccades and diplopic fields. Arch Ophthalmol 1979;97:1886–9. Cline RA, Scott WE. Long-term follow-up of Jensen procedures. J Pediatr Ophthalmol Strabismus 1988;25:264–9. Hayreh SS, Scott WE. Fluorescein iris angiography: Disturbances in iris circulation following strabismus operation on the various recti. Arch Ophthalmol 1978;96:1390–1400. Lennerstrand G, Nordbo OA, Tian S, et al. Treatment of strabismus and nystagmus with botulinum toxin type A: An evaluation of effects and complications. Acta Ophthalmol Scand 1998;76:27–37. Rosenbaum AL. The current use of botulinum toxin therapy in strabismus. Arch Ophthalmol 1996;114:213–4. Jampolsky A. “Duanes syndrome”. In: Rosenbaum AL, Santiago AP, eds. Clinical Strabismus Management. Philadelphia: WB Saunders, 1999:325–46. Metz HS. The diagnosis and treatment of abduction deficiencies. Ann Ophthalmol 1976;8:683–93. Gobin MH. Surgical management of Duane’s syndrome. Br J Ophthalmol 1974;58:301–6. Velez FG, Foster RS, Rosenbaum AL. Vertical rectus muscle augmented transposition in Duane syndrome. J AAPOS 2001;5:105–13. Morad Y, Kraft SP, Mims JL III. Unilateral recession and resection in Duane syndrome. J AAPOS 2001;5:158–62. Raab EL. Clinical features of Duane’s syndrome. J Pediatr Ophthalmol Strabismus 1986;23:64–8. Scott WE, Keech RV, Mash AJ. The postoperative results and stability of exodeviations. Arch Ophthalmol 1981;99:1814–18. Scott WE, Pressman SH. Temporary exotropia following surgery for infantile esotropia. Transactions of the VIth International Orthoptic Congress, 1987:106–12. Presented at the AAPOS annual meeting April 2000.